We have had a lot of rain this summer, which makes my usual salads unappealing on a wet day. This soup is one of my favourites as I love the Thai influenced flavours and it is so easy to pull together as most ingredients I already have on hand. I also try to keep wrapped portions of Thai red curry paste in the freezer for just this reason. If you need a bulkier meal you can easily bulk it up by adding rice or rice noodles. This recipe makes 4 servings. Peel, de-seed and cube the butternut squash into 1cm cube pieces, set aside. In a large saucepan melt the coconut oil over medium-high heat before adding the chopped onions, garlic and ginger. Simmer until the onion is soft and translucent, about 5 minutes. Stir in the curry paste and cook for a minute until it becomes fragrant. 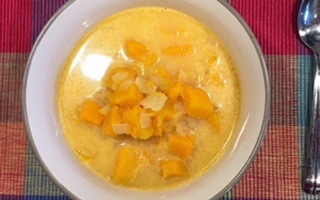 Then add in the sugar and salt and cook for one minute more before adding the squash, stock and coconut milk. Bring to a boil, then reduce heat and simmer for 20 minutes, or until the squash is tender. Enjoy!